As Himachal Pradesh readies for assembly elections on November 9, a prestige contest is simmering in Shimla Rural constituency where Chief Minister Virbhadra Singh's son and protege are facing each other in the poll ring. 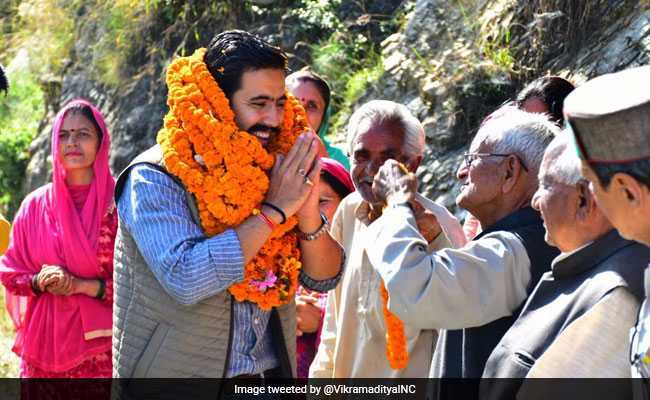 Himachal Pradesh Assembly Election 2017: Vikramaditya Singh during electoral campaign. As Himachal Pradesh readies for assembly elections on November 9, a prestige contest is simmering in Shimla Rural constituency where Chief Minister Virbhadra Singh's son and protege are facing each other in the poll ring. While Mr Singh vacated this seat, making way for an an easy electoral debut for his son Vikramaditya Singh, BJP's Pramod Sharma, incidentally his protege, entered the poll fray, heating up the contest. Mr Sharma's entry has ruffled some feathers for the Congress, which was planning a grand win for the chief minister's son. Chief Minister Virbhadra Singh, for whom Shimla Rural has been a stronghold, shifted out to contest from Arki assembly constituency, making for a safe entry for his son. However, Congress' Pramod Sharma from Sunni-Bhajji area, which holds a large chunk of votes, has put a spanner in his plan. In 2010, a delimitation was carried out for Shimla Rural constituency and parts of Shimla, Kusumpti and Sunni area were included in it. Sunni was earlier part of Kumarsein constituency which was scrapped in the delimitation. Kotgarh and Kumarsein areas were merged into Theog Constituency while Sunni was included in the newly-created Shimla (Rural) constituency. Mr Sharma, who was denied a Congress ticket from Theog in 2012, had contested as an independent and had got 4,480 votes. He has dubbed the election a contest between "royalty and commoner", though he is avoiding attacking the chief minister or Vikramaditya. "My father has been in active politics for 60 years, and it's my chance now," Vikramaditya Singh told NDTV. "I have been Youth Congress president but this is my first election. 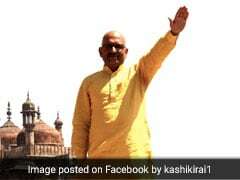 I am asking people to vote for me based on the reputation of beloved Rajaji people have built over the years. I might not have experience but I am a Shimla boy and I have a vision," said Vikramaditya Singh, fondly called 'Tikka' in local circles. Meanwhile, the chief minister has campaigned for his son, asking people to vote for development. He said that works worth Rs 1,300 crore were taken up in this constituency during the past five years. There are 71,073 votes in this predominantly rural but literate constituency including 36,047 men, 34,226 women and 800 service voters. With commissioning of 800 MW Koldam project by National Thermal Power Corporation (NTPC), a lot of development has taken in Sunni area and both the BJP and the Congress are claiming credit for it. The entry of BJP rebel Mohan Dass Sharma as an Independent candidate in the same constituency has made the contest more interesting as his core base of supporters remain undeterred, making the battle even tougher for Vikramaditya Singh.